I currently work as a forensic anthropologist and archaeologist for the U.S. government. 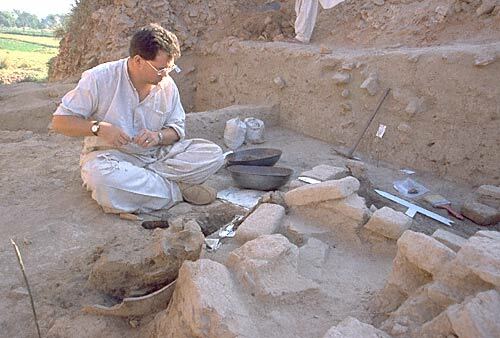 I am also the Assistant Field Director of the Harappa Archaeological Research Project (HARP) in central Punjab, Pakistan. Between 1992 and 1995, I studied various aspects of traditional fishing practices and butchery in the Punjab and along the Makran coastal areas west of Karachi and Balakot in the southern Pakistani provinces of Sindh and Baluchistan [map]. This research formed the interpretive framework for my dissertation, which I successfully defended in 1997. Due to a lack of understanding of fish in an urban economy, I elected to conduct an ethnoarchaeological project in order to understand traditional fishing practices and fish butchery in a South Asian context. I conducted research in both riverine and marine fisheries that appeared to have similar levels of technology that would have been present during the Indus Valley Tradition. This assumption was based on ceramic motifs as well as seals. This research was funded by a National Science Dissertation Improvement Grant, a Fulbright Student Fellowship, as well as the Harappa Archaeological Research Project (HARP). I would like to thank the directors of HARP, Drs. J. Mark Kenoyer, Richard H. Meadow, and Rita A. Wright for their unwavering support during the course of this project. Additionally, I would like to acknowledge the Department of Marine Fisheries, University of Karachi and the U.S. Educational Foundation in Pakistan (particularly Dr. Peter and Mrs. Erica Dodd) for their huge contributions in this research project. Of course, the Department of Museums, Government of Pakistan, granted me access to archaeological materials stored in their Expedition Branch in Karachi.